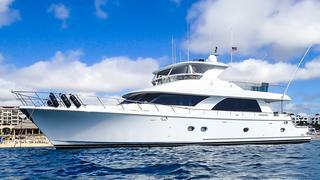 The 24.38 metre motor yacht Mick has been listed for sale by Todd Rittenhouse at Ardell in California. Built in GRP by Taiwanese yard Ocean Alexander to a design by Ed Monk Jr, Mick was delivered in 2007 as a cockpit motor yacht. Accommodation is for six guests in three cabins consisting of a full beam master suite amidships, a VIP suite forward and a twin to port, all fitted with 26 inch Panasonic television screens and all with en suite bathroom facilities. The entire interior is finished in finely crafted teak joinery accented by burl inserts in the horizontal surfaces and she offers plenty of space both inside and outdoors. The saloon is very well appointed, featuring a large sofa, two barrel chairs, a pop up 42 inch Panasonic television, an entertainment system and a wet bar. Forward of the saloon is a U-shaped galley with granite countertops, abundant storage and a full array of top-of-the-line appliances. Immediately forward of the galley is the pilothouse helm station and an adjacent U-shaped settee. Flybridge access on this yacht for sale can be gained through the pilothouse companionway or stairs from the main deck. The flybridge helm station features twin Stidd helm chairs, a U-shaped settee and a wet bar. A custom GRP hard top and isinglass enclosure provide protection from the elements. The crew quarters and engine room are accessed via a cockpit hatch. The crew area has the same fit out and finish as the rest of the boat and has a cabin with a double berth plus a kitchen area with microwave, sink and refrigerator. Twin 1,000hp Caterpillar engines power her to a cruising speed of 15 knots and a top speed of 18 knots. Lying in Cabo San Lucas, Mexico, Mick is asking $2,195,000.